"You are a tool!" said the Facebook message from a man I'd never heard from before. That's how I found out that Rush Limbaugh was attacking me on his radio show on Monday. Several more messages followed on Facebook and Twitter, from faithful Limbaugh listeners who presumed that what he was saying was true. It wasn't true, as the transcripts on Limbaugh's own web site prove. Then again, given what we know about polarization and media habits -- a new Pew survey, published Tuesday, shows that Limbaugh fans aren't likely to be CNN fans -- will his listeners ever read this column? Read the proof? On my Sunday program "Reliable Sources," I played a sound bite from Limbaugh's October 14 radio show about the Obama administration's reluctance to halt flights from countries plagued by Ebola. "People at the highest levels of our government say 'Why, why shouldn't we get it? Why should only those three nations in Africa get it? We're no better than they are.' And they have this attitude, 'Well, if they have it in Africa, by God, we deserve to get it, because they're in Africa because of us and because of slavery.'" I summed up Limbaugh's sound bite accordingly: "He thinks that they think we all deserve to get infected." 24 hours later on his radio show, Limbaugh called what I said "the latest effort at smearing me over this Ebola business." 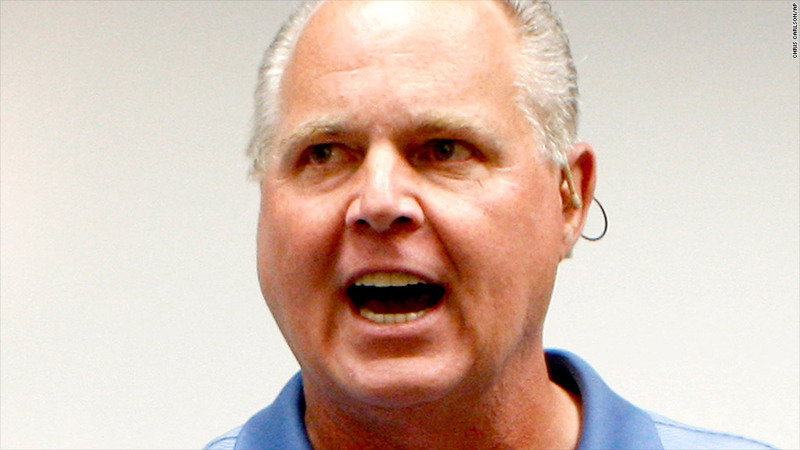 Limbaugh claimed that he was actually channeling what a guest on CNN had said about Ebola and slavery. The guest he was referring to was David Quammen, the author of a book about Ebola. Quammen appeared on "Anderson Cooper 360" on October 2 and condemned calls for flight stoppages: "I mean, we in America, how dare we turn our backs on Liberia? Given the fact that this is a country that was founded in the 1820s, 1830s because of American slavery, we have a responsibility to stay connected with them and help them see this through." Limbaugh latched onto that quote the day after it aired and bemoaned it as political correctness. He played it several times on his show -- and he used it three weeks later when he tried to play "gotcha!" with me on Monday. "I was explaining what he means, Brian, a guy who was a guest on your own network," Limbaugh said. "He's the guy who said what I was translating. He's the guy who was saying what you said I was trying to say. I don't believe that crap! I don't believe that nonsense." Limbaugh never mentioned Quammen during the October 14 segment that I pulled a sound bite from. (This is the transcript.) The people he mentioned were those "at the highest levels of our government," who, he said, have this attitude: "Well, if they have it in Africa, by God, we deserve to get it, because they're in Africa because of us and because of slavery." It's an incendiary thing to say -- and Limbaugh's been saying it over and over again. And without attributing that sentiment to someone else. Even on October 3, when Limbaugh did quote Quammen, he also said this: "These are the kind of people running the CDC. These are the kind of people running the FDA, the EPA, the IRS, the Justice Department, the White House. This kind of thinking that you just heard in this sound bite from David Quammen, that's what is leading the country." He took Quammen's comments and put them in the heads of officials from several government agencies. At one point he targeted President Obama specifically, saying "a bunch of people" view Ebola in America as "payback" -- and that "we have elected people in positions of leadership who think this way. The president is one of them." In other words, as I said about Limbaugh on Sunday, "He thinks that they think we all deserve to get infected." If Limbaugh really thinks he knows what's in the president's head, if he really thinks people "at the highest levels of government" believe in some diseased form of payback for slavery, he should defend this thinking -- not hide behind a three-week-old sound bite from a CNN guest.